Nicole Bates, 38, has had a special connection to Benzie County for as long as she can remember. When she was growing up, her grandparents had a cottage on Otter Lake and her family spent time there every summer. 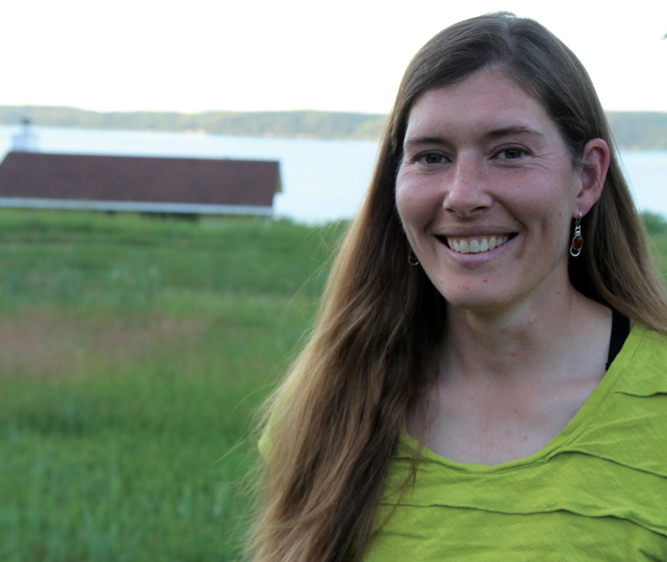 Years later, Bates met her husband, Ben, while both were attending Northern Michigan University; as it turns out, Ben grew up less than 20 miles from her family cabin. Needless to say, the couple said their vows at the site of the family cabin (gone by that time, as the property was acquired by Sleeping Bear Dunes National Lakeshore). However, the couple would not settle here for another 13 years—Ben joined the U.S. Air Force out of college, and the couple has lived in a bevy of states from Mississippi to Oklahoma, from Kansas to Washington. 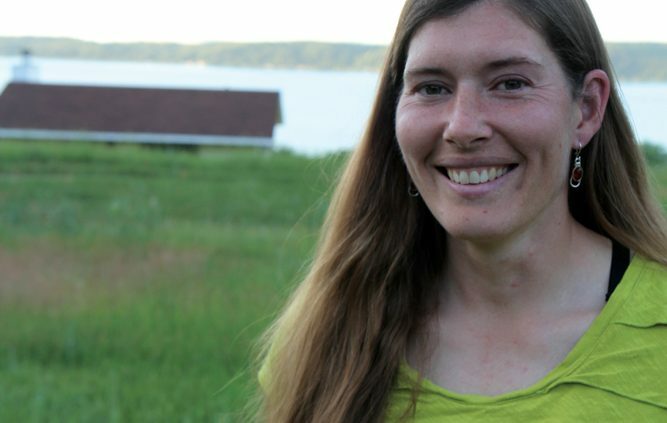 While her husband has consistently worked in the air, Bates has held jobs related to her training in speech therapy, but she has also been a stay-at-home mom, an organic-farm homesteader, and a sci-fi and fantasy writer. Finally landing in Frankfort in August 2014—one month after the birth of their second child, daughter Sophia—Bates began her own speech therapy practice, Encouraging Expression, which ranges from one-on-one, in-home appointments locally to virtual, online sessions with kids in school systems as far away as West Virginia. With a Bachelor’s degree in communication disorders and a Master’s in speech-language pathology, Bates has clinical experience with children and adults, in settings such as nursing homes and special needs classrooms. Continuing with our interview series on impactful Benzie County characters, The Betsie Current caught up with Bates at her home office. The Betsie Current: When did you know that you wanted to work in speech? Nicole Bates: I decided to become a speech therapist after a career-day presentation that I attended as a senior in high school. I wanted to help people. I’m very interested in language and communication, and this sounded like a great career choice. Current: Tell us about the different places that you have worked, and how does that compare with the work that you are doing now? Bates: After graduate school in 2002, I moved to Mississippi to be with Ben, who was in the Air Force pilot-training program. I worked in a skilled nursing facility in Alabama for a year and a half. We spent three months in Oklahoma, then moved to Kansas for Ben’s first assignment. I worked as a speech therapist in an Early Childhood Center in Haysville, Kansas, for two and a half years. Next, we moved to Spokane, Washington, where I worked in a private practice that specialized in helping individuals on the autism spectrum. I worked there for about two years, with some time off to have our first child, our son, Colton [now eight years old]. After Spokane, we moved to Illinois. I took two years off to stay home with Colton and instead ran our organic family farm and wrote my first full-length novel. When Ben was done with his assignment in Illinois, he transferred to the Michigan Air National Guard. We had hoped to move to Frankfort at that time, four years ago, but there was not a job available for me in the local area at that time. So we moved to my hometown of Indian River, where we lived for two years. I worked as a speech therapist for Cheboygan-Otsego-Presque Isle Educational Service District as an early childhood and preschool therapist covering three counties. I became pregnant with our second child, and at that point, we decided to make the move to Frankfort. Current: Why did you move to Benzie County? Bates: We both love the area. Ben wanted to be near a bigger airport, in order to pursue his dream of becoming an airline pilot—and now he has just started a new job with United Airlines last month—and our son was about to start first grade; we felt that, if we were going to make the move, now would be the best time for all of us. Current: When did you start working in Benzie County? How is that working out? Explain a little about the demographics of the people that you see in an average week. What does your weekly schedule look like? Bates: I have always wanted to start my own private practice for speech therapy, and I finally did so in May of 2015. It’s been steady over the last year, and I’m currently taking new patients. I feel there is a huge need in this area for speech therapy services—there are limited options for families in rural communities, unless you drive all the way to Traverse City or Manistee. I hope to fill that need. My first summer, I had some local clients, both residents and summer visitors. In the winter, with kids going back to school, referrals slowed down, so during the school year, I contracted with an electronic therapy company that provides services to schools and private clients over the computer in a FaceTime-type setting; for instance, I worked with kids daily at a school in West Virginia. I also began contracting with Centra Wellness Network of Benzie and Manistee counties, and I currently make home visits for clients as far away as Lake Ann and Manistee, clients ranging in ages from two to 55 years old. Current: Is there a busy season for you or is it pretty constant year-round? Bates: I haven’t been in business long enough to have noticed specific patterns in referrals; I think a lot of it will depend on the ages of the clients. School-age children can receive services through the school during the school year, and adult residents of assisted-living facilities can typically access services through the hospital or rehab staff for a period of time. It will be the individuals seeking something extra, I think, that will make up the majority of my clientele in the coming years. Current: How have you seen your work grow and change? How do you hope it will continue to grow? What’s next? Bates: Over the course of my career, I’ve experienced numerous changes in location, setting, and service-delivery model. I think this has given me a unique background to draw from. The online therapy was a first for me, and it was a great experience. I prefer in-person, but it’s a nice option for clients who can’t otherwise access needed services. The online therapy means that I can work from my home a lot, and the personalized visits to the homes of my local clients mean that I have been able to somewhat set my own schedule for the past year—both of which have been a plus with my young family, but I hope to eventually have an office space so that clients have the option of coming to me. I would also like to provide a wider variety of services, such as group treatment sessions, maybe baby sign language classes, or have in-house materials that help facilitate communication but that I’m not able to take with me to clients’ homes. I think this would also allow me to be more involved in community events. Current: What are the biggest challenges and rewards of working and living in Benzie County? What is the best or most rewarding part of your job? What is the toughest part? Bates: The biggest challenges, so far, have been spreading the word about the availability of this service and the travel time that is involved in conducting home visits. The most rewarding part is always helping someone, whether it’s helping them to engage with others non-verbally, improving their comprehension of language, or helping them to become a more accurate or effective verbal communicator. I think that positive human interaction is vital for every person. When someone is not able to communicate with others, it impacts every part of his or her life and can be incredibly frustrating for that individual, as well as for that individual’s family. Seeing someone be able to get needs met without a tantrum, be able to engage socially with peers, be able to have a conversation with friends, or be able to communicate confidently with strangers using an augmentative device or improved articulation—it’s amazing. Current: What are some ways that you and your business give back to the community? Bates: I have donated for the past two years to the Frankfort-Elberta Athletic Association annual golf tournament. Current: Tell us about your online speech work. How does it work? Is it gratifying? What’s good about it? What’s bad about it? Bates: The online therapy is a contracted service through an e-therapy company. I meet with a client on a video-conferencing program that allows us to see and hear each other, as well as share a screen to participate in the same activity. It was exciting to learn a new service-delivery model. I think it’s a great option for clients who can’t otherwise access services. It’s very fun for kids and students, and they tend to stay engaged simply because it’s on the computer. It’s more challenging for some diagnoses but works great for articulation and expressive language therapy. I miss the personal connection of being present with the client. I would like to focus on building my local clientele and perhaps, down the road when I have an office space, offer online services, as well. Current: What is your proudest achievement? Bates: My proudest work-related achievement is starting my own business. I’ve always thought that’s what I would want to do eventually, but it seemed kind of daunting. I think it’s been great. I’m also pretty proud of climbing up—and making it back down—Pike’s Peak in a single day by myself. Also completing a novel-length story. Current: Tell us a bit about your writing. Bates: After my son was born, I wrote my first novel and have been pursuing publication. Current: Tell us a bit about farming? Bates: While we lived in Illinois, we ran an organic family farm. We had a milk cow, meat chickens, laying hens, pigs, a huge garden, fruit trees, pecan trees, and a pond. I learned to milk a cow, helped birth a calf, buried another, chased (escaped) cattle back home, canned three winters worth of pickles and pears, helped process our own chickens, and made all of our food from scratch, primarily with farm ingredients. It was the hardest and most intrinsically gratifying work I’ve ever done. Current: How have you seen Benzie County change since you first visited? What are your hopes for the area in the future? Bates: I think the biggest change is the continued growth and number of visitors. It’s always been kind of busy in the summer but seems to be increasing every year. I think my biggest hope for the area is that more families choose to move here year round and that more affordable housing and good jobs are available to those residents. I’d like to see the schools continue to thrive and be able to add more programs. Current: What else does Northern Michigan/Benzie County need? Bates: More good-paying, year-round jobs and affordable housing. Current: What other things are you involved with? How did you get involved with them and why are you passionate about these causes? Bates: At this point, mostly my kids. Current: How long have you been running? What is it about running that you liked so much? What is your favorite distance? How many days a week do you run? How many miles in a typical week? Bates: In high school, I played basketball, volleyball, and softball. We had track but not cross country, so I didn’t discover my love of running until college. I took a PE jogging class, decided I loved it, and started running a lot on my own. I walked on to the NMU Cross Country team in 1997. Volleyball had been my favorite sport, and I played on club teams through college, but as I got older and moved, it became harder to find teams and places to play. It’s much easier to fit a run in around work or with kids. I like the time outdoors, I like pushing myself physically, and–at this point–running for me is like coffee for most people. Until I get my run in, I’m kind of tired and cranky. My favorite race distance is probably 10k or half-marathon. I run six days a week. Typically six miles for five days and then a longer run of nine to 12. I’m still working back up to the 12 after Baby #2. Probably about 38-40 miles per week right now. Current: What local races are your favorite to run? Bates: Firecracker 5k on 4th of July, Betsie Bay Frozen 5k in February, Port City run. Current: How many times have you run the Beulah Firecracker 5k? Bates: I started running this race when I started dating Ben in 1998. We’ve missed a couple over the years, but maybe 16 times? Current: What’s your perfect summer day look like in Benzie County? How would you spend it? Bates: Waking up early before the kids and writing while I drink my tea. Breakfast with my family. A run and bike ride on the trails. Lunch out in town, followed by an ice cream cone while we walk on the beach. Grilling dinner at home while we sit and play outside. Drinks on the lawn, watching the lake/sunset. Reading late into the night after the kids are asleep. Feature photo: Nicole Bates is a speech therapist working locally (will travel to your home) and nationally (over Skype/Facetime to a school in West Virginia). Photo by Aubrey Ann Parker.